Your little pup will leave your slippers alone when you give them their very own Slipper Dog Toy in Green! 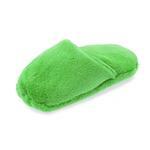 Keep your toes warm while your dog plays with their own Slipper Dog Toy in Green! This tiny version of a slipper is an adorable way to teach your dog to bring slippers to you. This slipper dog toy in vibrant green is soft and cuddly and is perfect for napping with, fetching, and mouthing. Increase the fun by hiding tiny treats inside! Posted On 08/17/18 by Sal from , Yes, Sal recommends this product! My sister bought my dog this slipper about 2 years ago, it was the first time she ordered off of this website and we have been ordering these slippers from here ever since! My dog loves to play with it. Its your basic old fashioned dog toy! Our Puppy JoJo Was So Excited when we gave him his New Toy !???? This is cute for a photo prop & the color is great for Christmas poses, but the small size is too tempting for my bichipoo who wanted to destroy it immediately with a strong chomp. We have larger fleece slippers which are very durable, travel everywhere my dogs roam, and serve as sleeping buddies, too. I was expecting this to resemble them, but the tiny size is only safe with my one dog and in danger of immediate extinction with my other. Great variety of products and great prices.